Riding a motorcycle can be exhilarating, with your speed, maneuverability, and contact with the open air bringing you a sense of excitement and connection to the world around you. But unfortunately, it can also be dangerous; per mile, motorcycle accidents that result in injury or death are 35 times more likely to occur than car accidents. Most experienced riders know that motorcycle accidents are especially risky, but new motorcyclists should take extra precautions to ensure they’re meeting safety standards and maximizing their chances of emerging unscathed. Low visibility. Motorcycles are smaller than most other vehicles, and are often more maneuverable. This makes them less visible to drivers, and therefore harder to avoid. Limited shielding. Being in a car surrounds you with a strong steel frame, and gives you seatbelts and airbags to restrict you further. On a motorcycle, there’s far less shielding to protect you in the event of a collision. Skill. Motorcycles can be harder to master than cars. They turn, brake, and accelerate differently, which means inexperienced riders can find themselves overwhelmed quickly. So what extra steps can you take to protect yourself? Wear a helmet. Wearing a helmet is the easiest way to protect yourself while riding, and in many places, you’re required by law to wear one. Even a basic helmet can provide additional protection; it won’t cost you much money, it won’t restrict your field of vision, and it won’t deter your overall experience. It will only serve to protect your head and neck if you’re involved in a collision. Invest in the right bike. If you’re new to motorcycle riding, choose your first bike carefully. A big bike with lots of power may seem appealing, but if you don’t know how to handle that power, you may be even more likely to be involved in a collision. The same is true for vehicles with high rates of acceleration that you aren’t prepared for. Increase your visibility. Take measures to make yourself more visible on the road. Sometimes, that means wearing brighter clothing. While you’re riding, make sure to occupy the edges of a lane, swerve a bit before coming to a stop to make your headlight more visible, and tap your brakes when coming to a stop to make your brake lights more visible. Wear thick clothes. Wearing a T-shirt and shorts on a motorcycle is asking for road rash. If you’re involved in a collision, you’ll almost certainly be thrown from the vehicle, so make sure you’re wearing long sleeves, and preferably, a thick material like leather. Be aware of your surroundings. Don’t assume other drivers can see you. When riding, stay acutely aware of your surroundings, including how the cars around you are driving and what conditions or hazards might affect the road. Spotting an unpredictable behavior or condition even a fraction of a second earlier can help you avoid an accident entirely. Be defensive. Defensive driving is one of the best ways to protect yourself on the road, even if you aren’t on a motorcycle. Defensive practices include allowing more space between you and other drivers, looking far ahead, controlling your speed, and watching and respecting other drivers. Collectively, these strategies will reduce your chances of being involved in an accident. Avoid inclement weather. 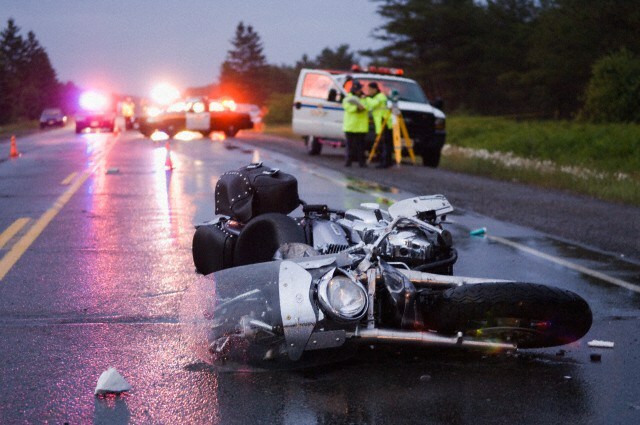 Motorcycles are even harder to control, and other drivers are even less predictable when inclement weather (like fog, snow, or icy conditions) enters the picture. Avoid driving in these conditions whenever possible. Get experience wisely. An experienced motorcycle rider is far less likely to be involved in a collision, but everyone starts out as inexperienced. Your goal should be to get your experience wisely, in controlled environments, with motorcycles you can handle, then gradually work your way up. Use the highways. Some new riders instinctively avoid the highway because of its high speeds, but 91 percent of all motorcycle crashes actually occur on non-interstate roadways. Highways offer much smother traffic patterns, fewer intersections, and more predictability, making them somewhat safer. Use hand signals in addition to turn signals. Turn signals should inform other drivers about the moves you’re about to make next, but a little redundancy can ensure your signal is seen. Learn the proper hand signals for signaling turns on a cycle, and employ them in addition to your built-in turn signals. The extra risks of riding a motorcycle shouldn’t deter you from riding one entirely, but you should take those risks into consideration—and prepare for them appropriately. These strategies could save your life.